courtesy of Marjorie Warvelle Bear's "A Mile Square of Chicago"
Chicago (population 2.8 million) is in northeastern Illinois in eastern Cook County. Lake Michigan, along with the Chicago and Des Plaines Rivers are the main waterways in the city. Interstates 55, 57, 90, & 94 will all lead you to the "Windy City." From what started as a small village in the early 1800’s along the banks of Lake Michigan, Chicago has grown to the nation's third largest city and one of the most famous places in the world, as the result of an ethnically diverse community that adopted the city. English High School (also known as English High & Manual Training) was opened in 1886 as an all-boys' three-year high school, flourishing as the city grew by leaps and bounds during that time. The school, which opened in the former Chicago Central building, became a four-year institution later in the 1890's. The school was named English High and Manual Training because all instruction was done in English (rather than the mother tongue of those immigrant students and their families), and to be purely mental while educating the coordination of hand and eye for the students so they could serve the communities they lived in once they graduated in an intellectual and self-sufficient manner. English High and Manual Training moved to the corner of Oakley and Van Buren in 1903, then changed its name to Crane in 1905 in honor of plumbing magnate Richard T. Crane, who was responsible for pouring the first mould in 1855 for what would become important to fighting fires....the fire hydrant. 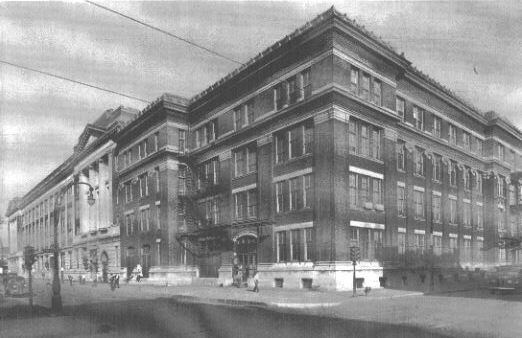 That school would later add onto its campus in 1922, and welcomed students from the former McKinley High campus when that school closed in 1954. English offered several sports for its students, such as track, swimming, softball, tennis, football, and boys' basketball. It is possible that baseball was also offered. If anyone has information about this, please contact us at the addresses listed below. The school was competitive during the spring months around the turn of the 20th Century, bring three state championships and as many top 10 team finishes at the state meet in Urbana-Champaign. 1896 TIED FOR 5TH IN STATE!!! English made some "waves" when it started to compete in 1898. That year, a annual swimming carnival was started that year in the Chicago area as a English student won an 80-yard race, in what is considered the earliest-known prep swim meet in the state of Illinois. The school also had a water polo team around the same time as prep swimming teams were in their infancy, and joined the Interscholastic Water Polo League in 1901 along with Armour, Lewis, Oak Park, and Austin, among others. The Cook County League, in which English was a member, offered this winter version of indoor baseball, using a softer ball and thinner bats than the ones used in outdoor play. In 1895-96, English joined the league along with North Division, South Division, West Division, South Chicago, and Medill for this sport. After the name change to Crane in 1905, that school (with the Halas brothers, Frank, Walter, and George--yes, the founder of the Chicago Bears!) went on five titles in seven years between 1907 and 1913. English did take to the courts with rackets in hand as early as 1894 when the school played against other schools such as North Division, Lake View, Oak Park, Evanston, and Englewood, and West Division, all of which played in the Cook County High School Lawn Tennis Association tournament that year. English High did engage in the football wars during the fall months with other members of the Cook County League as they won the 1899 season title for the school. This winter time sport, which would eventually took over the spotlight from indoor baseball, was also offered at English. The school was a participant in the Cook County League's first season of play during the 1900-01 school year. go out to historian Robert Pruter for helping mold this page into what you see today. His work can be viewed on the Illinois High School Association's website in a section called Illinois H.S.toric (http://www.ihsa.org/initiatives/hstoric/index.htm).